Need something different to ensure you message or marketing campaign is noticed? Try sky writing. 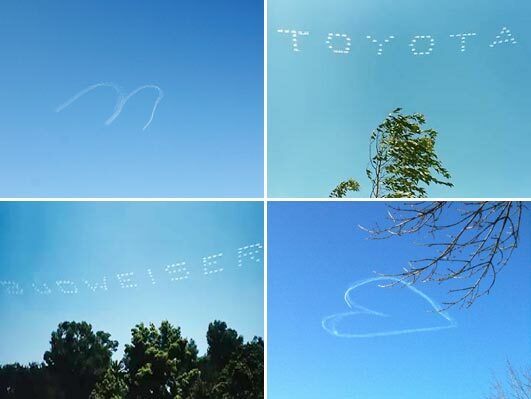 Sky writing is a type of aerial advertising that use aircraft to spell out words or sketch symbols in the sky. Skywriting messages are literally 1,000 times larger than any road side or aerial billboard. The average skywriting message is created at an altitude of 10,000 ft. and is visible within a radius of 15 to 20km. It is sure to maximize awareness as we engage your audience through our text messaging in the sky. Imagine targeting your sky message over peak rush hour traffic, over an event, over a beach, over a park or over an amusement park. Your message can be easily viewed and your brand awareness can be quickly reinforced. At Aerogram, the aerial media company, we use an environmentally safe white vapour to trace our airborne messages in order to reduce our overall carbon footprint and help keep our environment green. The blue sky can be your blank canvas … so what message would you like to be spelled out for millions of attentive on-lookers? Contact us to see how our sky writing service can generate maximum awareness and captivate your target audience.